Be Cautious Not To Tip The Scales In Your Spiritual Life. From the beginning of one's walk with Jesus, the Christian is bombarded with conflicting messages pulling you to one side of a topic or the other, usually being told that the other is wrong and to be avoided. 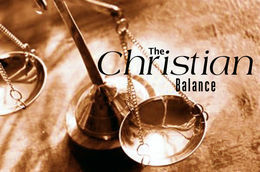 Personally I have found that there is a type of "balance" to be found when approaching the tenets of Christ. As you read, keep in mind that I am not advocating compromise or luke-warm thinking as there is even a balance to be found with the balance otherwise one may fall into the error of believing all faiths to be valid, falling for the "Hegellian fallacy" or adopting a dualistic mindset. On one side of the spectrum we have the strict literalists who take the Bible as being literally true word-for-word, however it cannot be avoided that there are idioms, metaphors, similies and symbolic language. On the other side however there are the liberal types who spiritualise everything that seems supernatural in order to 'modernise' Christianity, often resorting to making radical changes to the meaning of the plain text to fit their politically correct bias. The solution is simple. It is scriptural and it is common sense. God designed and inspired every word of the Bible and warned us not to tamper with it or try to apporach it with our own limited understanding. In knowing this we should realise that it is not US who interprets scripture but scripture which interprets itself...for every symbolic phrase there is an interpretation elsewhere in scripture, so it will take the diligent Bible student to learn what is being said. The rule should be to take scripture at face value until it is obvious that symbolism is being used. Fortunately, the basics of the Gospel, the main and most important thrust of the entire Bible are written in plain and simple language- Salvation by faith in the death, burial and resurrection of Christ for our sins. God is both logical and emotional. One cannot be persuasive of just emotional arguement, as it *can* be seen by others as subjective and not withstanding of logic. However it does have it's place..
On the other side of the spectrum, we cannot use pure logic *solely* as a means to witness as it is cold and unfeeling. Much as they would deny it, I have observed that many atheists for example, state that they seek emperical evidences or proofs for God -just the cold hard facts..yet almost invariably, emotionalism creeps in with complaints such as '..then why did God do this....' which makes into an emotional issue as well. As being made in His image, *we* also are logical and emotional and must facilitate both when communicating to others- the balance must be found..it *may* not be an even balance, and it very well may have to be fine tuned as long as one lives, but it is neccessary. God's Love vs God's Justice. You cannot separate God's love from His justice- the two go hand-in-hand, yet there are many liberals whom would claim that God is love (and love is God) and in being so could not do anything unpleasant and would not send anyone to hell. Then we have the legalists who would have us still adhere strictly to the Old Testamant law. Without Justice, God would be no better than us..permissive and too relaxed about sin, not caring too much what we do to others or Him- thusly making Himself less than Holy. Without a standard, anyone could do absoutely anything they want and get to heaven- cheapening Christs sacrifice...which is the greatest demonstration of love. "God's love would have forgiven the sinner, but God's rightousness prevented the forgiveness. God's rightousness would have judged the sinner, but God's love restrained the judgement." There are a thousand and one other 'balances' to be found, if one reads what the scriptures say. Preach to me no more sermons on God’s love, unless it is accompanied by a message of His holiness. Preach to me no more sermons of His amazing grace without mentioning from what His grace saves me. Preach to me no more sermons of my Lord’s mercy except it be contrasted with what He would otherwise be just and righteous to do. I cannot understand this God of love without hearing of His many other characteristics. My God is woefully complex, but He has been reduced to a god of mere sentiment and romance, which god has no power to save. Explain to me the wrathful God of the Old Testament. Acquaint me with His jealousy; why is His Name Jealous? When God says He “hates,” tell me what is it He despises? Show me His anger in full that I might know the object of this anger and avoid it in my own life. Don’t down play and trivialize His anger, I know He doesn’t change. Show me the horrors of hell that I might truly prize my salvation and seek to share Him with others. Teach me to be hopeful of Judgment Day but to share with those whom are lost they should greatly fear it. Declare God’s holy commandments that I might have a portrait of His purity and holiness and conversely, that I might know what sin is. Proclaim to me my sin â€“ that I lie, that I cheat, that I hate and covet. Tell me of my helplessness to keep said commandments that you might impress upon me my dire need of a Savior. Once I have a grasp of the abomination of sin, then and only then, show me my Savior! When I fully comprehend the depth and breadth of my personal sin, my original sin, my self-righteousness and my unbelief, then the Gospel will really be Good News! When I realize my nakedness before God, my utter bankruptcy with respect to sin, I might esteem my deliverance utterly. Pastor, teach me the meaning of repentance, that I might truly be forgiven. Show me true humility that I might know its semblance. Declare to me the offense of the cross and expound upon its meaning. Tell me, Pastor, why does it offend? Don’t merely tell me this is God’s love; help me to see His perfect justice in this Event. Describe for me also the representation of His holiness and righteousness at Calvary. Explain to me that this is what I have escaped through a life laid down for Christ; that this is the hell I deserved and instead Jesus took the punishment. Tell me that on that day, He became sin for sinners. Then permit me to see by example how to live for this beautiful Savior. Help me to see in you the life of the redeemed. Show me your love for the lost; teach me likewise how to pour out my heart for them. Then finally, tell me of God’s wonderful love for me. Then I think I will really understand “how great is the love the Father has lavished on us, that we should be called children of God!” Then I know I will understand. Then I will be truly in His loving grip. As you can see, it is a mistake to favor one of God's qualities over the other..you must take Him for who He is, or not at all.